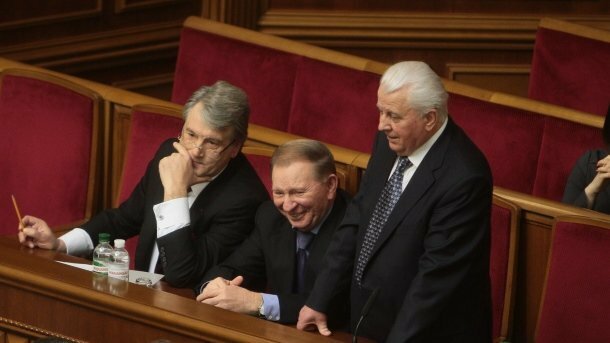 Former Ukrainian presidents Leonid Kravchuk, Leonid Kuchma and Viktor Yushchenko made a statement about ideas to introduce martial law in the country. They believe that such a legal regime will lead to chaos in society. 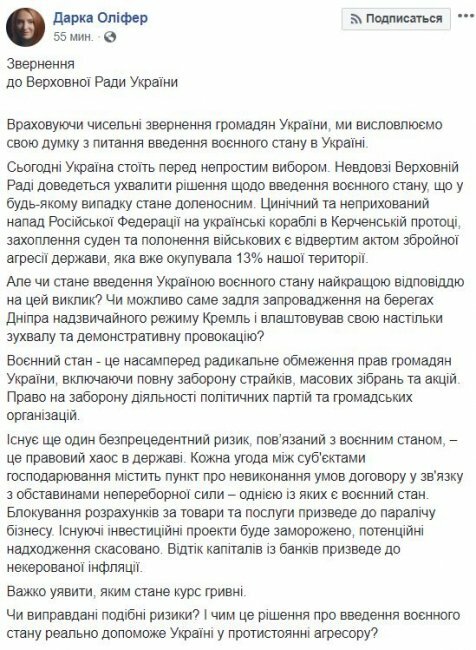 The corresponding statement was published on Facebook by the press secretary of Kuchma Darka Olifer. They do not exclude that the Kremlin could deliberately arrange this provocation in Azov, so that martial law would be imposed in Ukraine. "The martial law is primarily a radical restriction on the rights of the citizens of Ukraine, including a total ban on protests, mass meetings and actions The right to ban the activities of political parties and public organizations There is still an unprecedented risk linked to the martial law – this is a legal chaos Every transaction between business entities contains a clause on non-compliance with the terms of the contract as a result of force majeure, including the state of siege, goods and services will lead to paralysis of the company Existing investment projects are frozen, potential revenues canceled Capital outflows from banks will lead to uncontrollable inflation It is difficult to imagine what the hryvnia rate will be.– said in a statement. Former Heads of State recall that since the beginning of the war many serious war crimes against Ukraine took place – Donetsk Airport, the annexation of the Crimea, Debaltseve, Illovaysk, but even such events with thousands of deaths did not become an argument for martial law, which would mean that – economic and consequences. "It is clear that other arguments have appeared today, and most probably of a political nature: these are elections, but the majority of society believes that democracy can be limited in this way: these suspicions are extremely dangerous – they can lead to a public conflict that will certainly benefit the enemy … We believe that deputies must adopt a resolution of the Verkhovna Rada on the appointment of presidential elections on 31 March 2019, as well as the introduction of martial law and amendments to this law. provided by the current Co Institution of Ukraine "– said in a statement. Reportedly appeared President Petro Poroshenko's decision on the approval of the decision of the National Security Council on the state of siege. The implementation of the decree is entrusted to the secretary of the NSDC Alexander Turchinov. Among other things, the army was instructed to provide partial mobilization measures to organize and carry out training camps with operational reservists in the required quantities. Now it is up to the Verkhovna Rada, who is in no hurry to make a decision. see live broadcast from the parliament. As told in the comments on the site "Today", the coordinator of the "Information Resistance" group, people's representative Dmitry Tymchuk, The law on the legal regime of the martial law is very flexible, it is not mandatory to enter all points. That is why the most important question on the agenda of the parliament will be which items must be introduced. Read more about how the army can take power into its own hands, in the article "Today": "What you need to know about the martial law of 2018 in Ukraine."